Evening Dresses and Evening Gowns for a Special Occasion. Types and Styles of Evening Dresses. When shopping for evening gowns it can be a hassle to decide which style, color, or shape is right for your needs and tastes. There are many deciding factors when choosing evening dresses for any occasion and many women struggle with the choice of what evening dress is right for which occasion. For those of us that have no clue about how to choose the perfect evening dress, here are a few tips that may help with the difficult task of finding that perfect evening gown for any party, prom, or dinner date. In order to pick the best dress for your body type, it is great to know what types of dresses there are available and how they can compliment a specific figure. The A-Line dress type is great for the fuller figured woman. As the name implies, this type of dress is usually fitted at the waist and widens with the skirt, giving the look of a capital letter A. These type of evening dresses will make the waist look smaller by having a wider skirt and is sure to be a hit for anyone wishing to hide that feature. Mermaid Dresses are typically fitted from the bust to below the knees where they flare out, giving the impression of a mermaid tail, hence the name. This type of evening dress is great for the woman with a smaller bust or waist and is perfect for the woman with a shorter stature by focusing the eye on the length of the dress. The Empire Dress style is a style of evening gowns that is fitted just below the bust line and then falls straight to the floor. This dress style is for the woman who has a larger bust and larger hips by focusing the attention on the bust and hiding the hips. 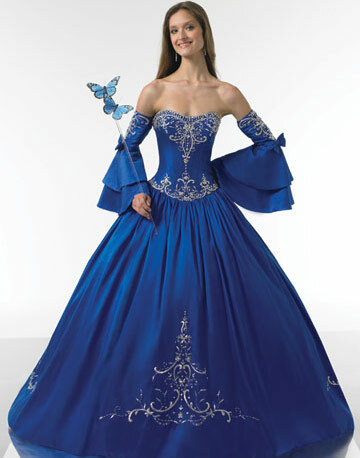 Hourglass shaped evening dresses typically have a more defined top, slender waist, and fuller bottom. Women who have the classic figure will benefit more from this dress style as it will accentuate their curves in all the right places. 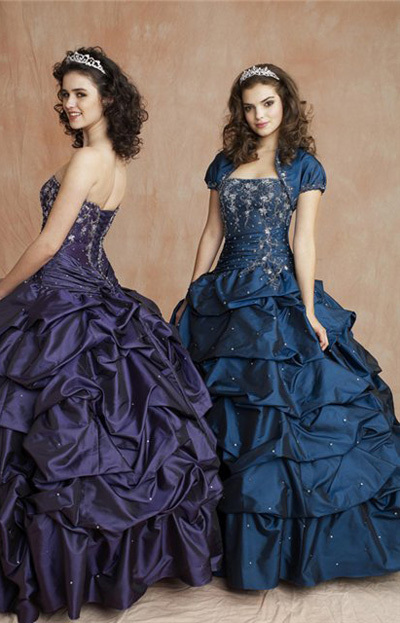 And of course there is the Ball Gown type of dress. This dress style is by far the most classic style of evening gown and is perfect for complimenting any figure and style. When choosing between evening gowns, fabric is a main component. Silk Charmeuse is a very popular choice for evening dresses because of its lightweight material and its pretty satin finish. This fabric is made using a satin weave which makes it soft to the touch and allows it to drape flawlessly. It is extremely versatile and can be used for thousands of evening gown types and designs. Silk Charmeuse is delicate, however, and should only be hand washed or dry cleaned. Silk Taffeta is another great choice for evening dresses and gowns. This material is crisp which makes it crease very well, and has a beautiful shimmery sheen that is caused by a double weave of contrasting colors. It is mostly used as a fluffing liner under ball gown type dresses or any dress with a full skirt, but can be used gracefully as a fabric for tighter fitting gowns. If you are looking for a fabric for your evening dress that has both visual attraction as well as texture, Silk Shantung is the choice for you. This fabric is fairly heavy and wove simply instead of intricately which gives the fabric a ribbed effect. It is great in that it is heavy enough to drape nicely while not being irritating, but it is a dry clean only material that is naturally stain repellent. 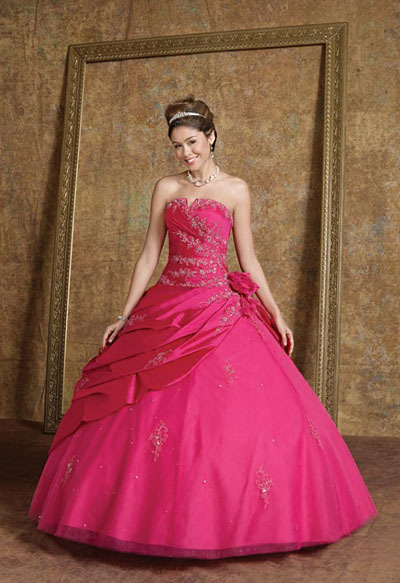 The color that you may want your evening dress can vary from person to person. We all have our favorite and not so favorite colors, but it is also important to choose a color that will compliment your specific skin color to optimize the experience you want when wearing evening dresses. If your skin is very pale or pink in hue, a pastel or blue color will work perfectly for you. Black and really bright colors should be avoided as they might surpass the natural beauty of your skin and be too unforgiving. Skin that has golden undertones matches beautifully with fall colors, such as orange, brown, beige, and gold. Women who fall into this category should not wear blue, pink, and black because these colors will clash with the natural shade of their skin. Olive colored skin, like that in some African American and Asian ethnicities, looks beautiful against white, black, red, and pink tones. These colors do not overpower the darker color skin like pastel colors do. If you have cream or ivory tones skin would be beneficial in choosing warm colors for an evening gown. Colors like green, rose, yellow, and red are among these, but white and any dark color should be avoided. No matter the event that requires formal wear, it is easy to choose the right dress type for any occasion. Dressing for a wedding will mean lighter colors, modest fit, and suitable length. It is considered unseemly to wear black and brown to a wedding in some cultures, but in others it is not such informality. It largely depends on how well you know the bride or groom, and what theme the wedding is. Otherwise, keep the evening dresses chosen for a wedding engagement simple, elegant, and suitable. When dressing for a more casual party, such as a birthday or graduation, a cocktail type evening dress is the most appropriate choice. Something with or without straps can be worn, and length will most likely not be an issue. For events that are more fun and party centered in nature, a shorter more flirty evening dress can be worn, while for the office or school occurrence, a longer more formal cocktail dress will work perfectly. If the destination is a prom or formal dance, the options for choosing evening gowns will get larger. In today’s culture it is perfectly normal to wear whatever type of dress you want to any prom or dance (read more about prom dresses and prom hairstyles and ideas). The only thing that really needs to be considered when choosing an evening gown for this type of event is what do you like best. An evening gown is also acceptable for places like an opera house or stage play. Also it largely depends on your personal style and taste. Of course, it is important to take modesty into consideration when choosing evening gowns for any occasion. No one wants to show up to a wedding or prom in a dress that will make their parents blush, but for a private party or bachelor/bachelorette party, it is acceptable. Dresses for the casual dinner party or social gathering need not be too glamorous and women trying to choose a night going out dress for these types of occasions can go with a simple, sheath type dress. These dresses are usually shorter in length, which is ideal for the casual night out. Longer dresses are more known for formal wear and only in the case of a more romantic or solitary dinner setting would they be appropriate. A cocktail type evening dress has the versatility of coming in long and short versions and can be worn appropriately for any dinner engagement, casual or formal. A great incentive to buying evening gowns and night going out dresses online is there is a great chance you will find the perfect dress at a considerably lower price than in a department or bridal store. Another great perk is the majority of evening dresses that can be picked through in a limited time. If you are shopping from store to store it can take weeks or even months to travel, try on, and finally purchase the evening gown that you really want. Even so, it is important to take at least one trip to a physical store to try on dresses. This way you can know what fabric feels the best on you, and you can better have an idea of what you may want in a evening dress before shopping online. Research terms and conditions of returns before you make an online purchase. If you choose to purchase your evening gown from a reputable merchant you will have a better chance of getting your dress returned or repaired if it arrives to you damaged or it doesn’t fit. When ordering a dress online it is also important to make sure your dress arrives to you with plenty of time between delivery and the event to ensure that you can have any alterations done if needed. As with many different types of clothing, different brands and designers of evening gowns will fit each individual differently. There may be an evening gown that you absolutely love, but just doesn’t fit quite right. Tailors and seamstresses are very easy to find to alter that evening dress to perfection and you do not want to be worried the day before the big event if your evening gown will be ready in time. Copyright © 2011-2019. Evening Dresses. All Rights Reserved.